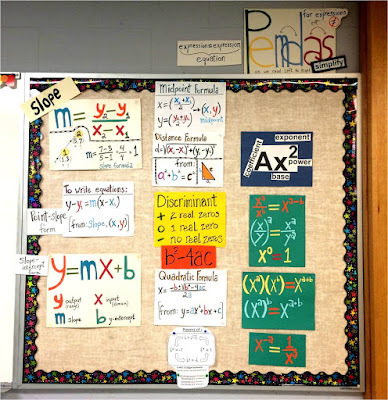 When I taught math in Boston my classroom was next to a Geometry teacher who had a math word wall that spread just about floor to ceiling. At the time I thought it was a bit extreme. I mean, aren't high school kids a little old for so many visuals? Did they really need all that? 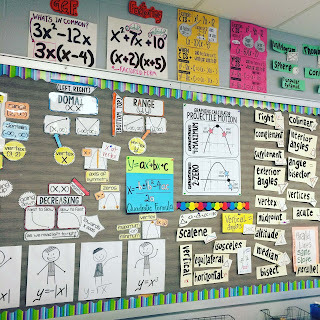 Well, my teacher neighbor went on to become Teacher of the Year and I went on to realize how powerful math word walls are - especially those that show math vocabulary in context. Before landing that first full-time teaching job, I was a substitute teacher for a year. I'll never forget a job I took in a kindergarten class. The letter of the day was K. Some kids could write "kite", "kat" (English is so weird), while other kids couldn't even write a K.
The discrepancy in abilities I saw that day in kids so young completely blew my mind. If there was such a large span of abilities in five year olds, what about in 15, 16, 17, 18 year olds? And how would I reach them? In all of our classrooms there is a wide range of abilities. Some kids are above grade level while others may be years behind. 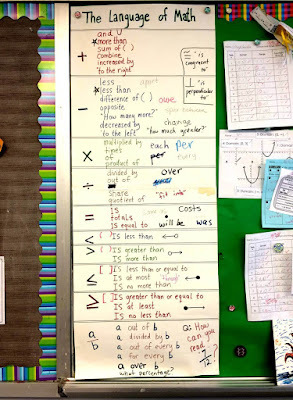 What I like the most about math word walls is that they are always there offering information to students who need it. Whether they are too shy to ask a question or need a quick reminder, or maybe they have a hard time concentrating so do a lot of looking around the room. While they are glancing around, maybe they'll learn something new. Word walls allow kids to access the curriculum at their level and continue to offer support every day. 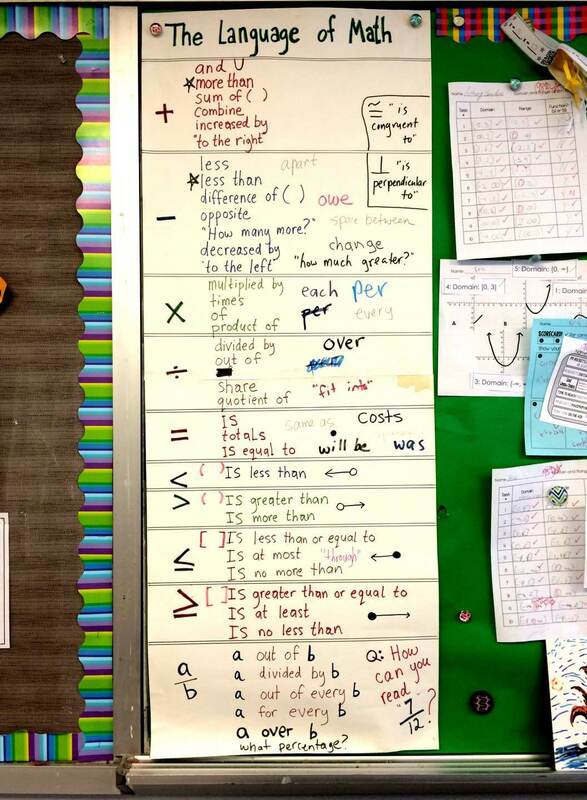 I write more about this in the post 5 Ways Math Word Walls Have Changed My Teaching. In this post I'll share photos of my own classroom's word walls (like the photo at the top) as well as photos of word walls I have made for teachers by request. 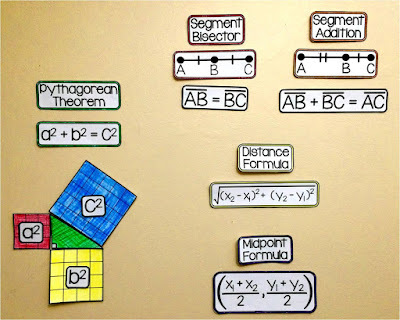 This post is linked in 8 Out-of-the-Box Ideas for Teaching Algebra and Geometry on the We Are Teachers blog. My teacher back in Boston neighbor was absolutely right in putting it all out there like that. If you think about it, there's a measly 5 year age difference between a 4th grader and a 9th grader. Yes, kids do grow quick, but what is it about those 5 short years that suddenly allows students to remember and recall everything and no longer need visual reminders? When my husband moved from teaching elementary school to high school he was a little worried. I told him that high schoolers are just little kids in big bodies. It's true! They still need the support of word walls as much as the little ones do. 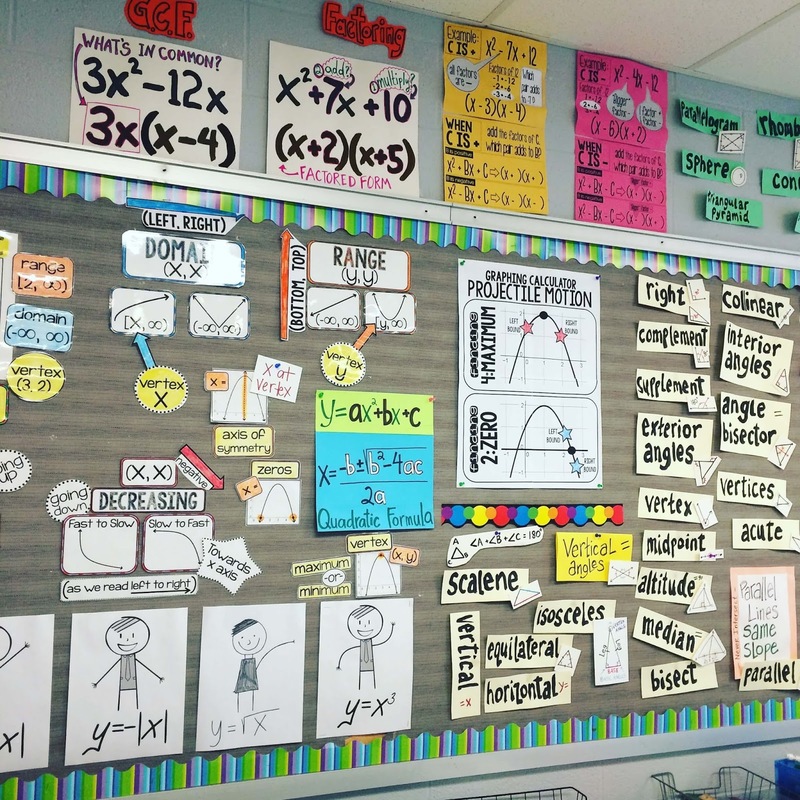 For me, adding math classroom decor to my walls not only made my classroom a more inviting place to learn, it also made it one giant reference sheet. This immediately lowered my students' anxiety levels to where memorization and past misconceptions were no longer sticking points. 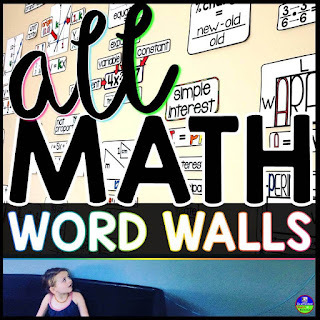 All of my math word walls are available in this math word walls bundle. 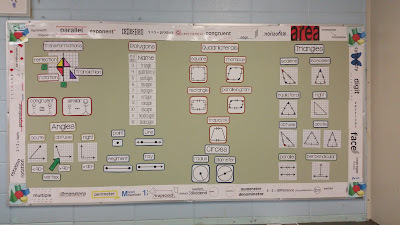 Each math word wall is available individually. Since starting at my current school, I have taught Geometry, Biology, Consumer Math and Algebra 2. Since Algebra 1 is so important, we have references for it too. Here are some photos of the word walls in my classroom. 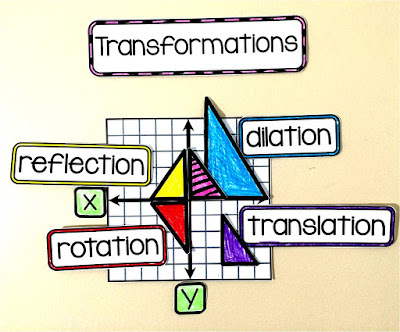 Here you can see an anchor chart for drawing and naming points, lines and segments. I made the parallel lines cut by a transversal poster below it from cut paper. I have a free parallel lines cut by a transversal poster and coloring page here. 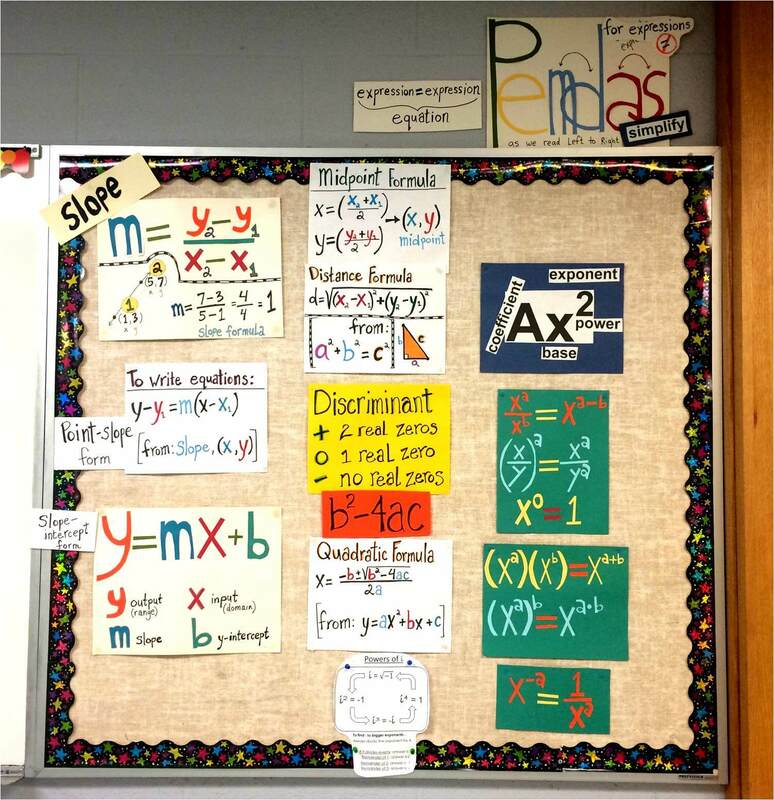 Next up is our wall of Algebra, Geometry and Algebra 2 formulas. I like to think of this wall as "the hodgepodge", though I have since updated most of my math word walls. This exponent rules posters is made out of cut paper too. 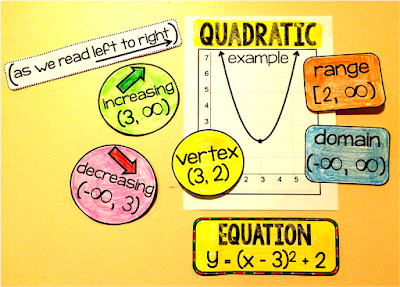 I added exponent rules into my 8th grade math word wall. 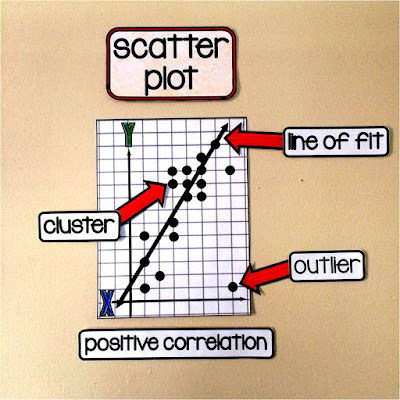 Here is a photo of some of the graphing references included. 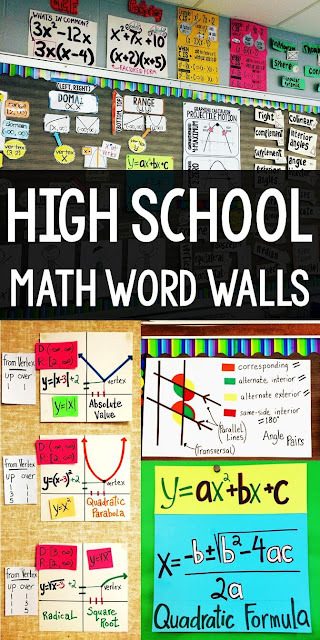 You can also see all of the middle school math word walls I have made in the post Middle School Math Word Wall Ideas. This PEMDAS mobile was a recent addition. Our Algebra 2 word wall has grown a lot over the years. 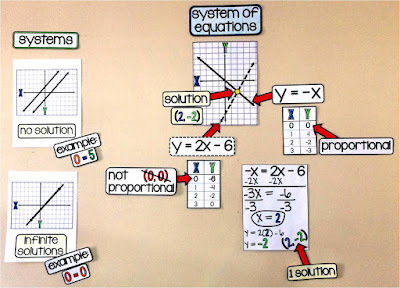 Teachers have asked me to make parent graphs for nonlinear functions and also expand the word wall in other areas. It's gone through a lot of updates! 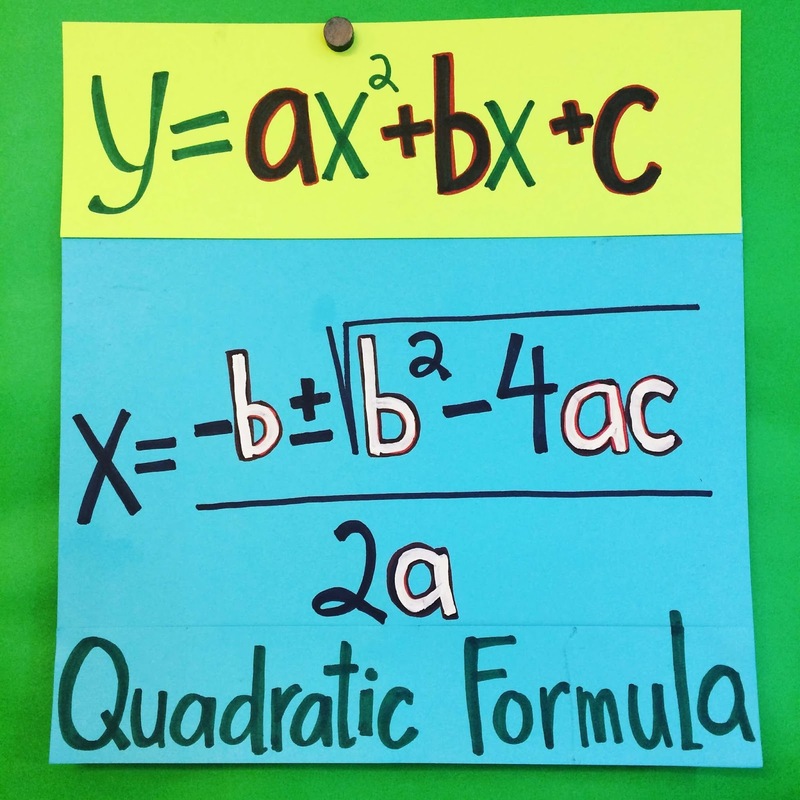 :) Here's a photo of our reference for quadratics. 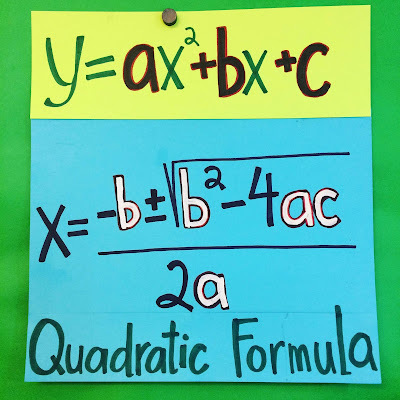 And of course we need a Quadratic Formula anchor chart. My students were able to use this one a lot more effectively once I added the white-out to the a, b and c in the formula. You can read more about the quadratics activities we do in class in the post Fun with Quadratics. 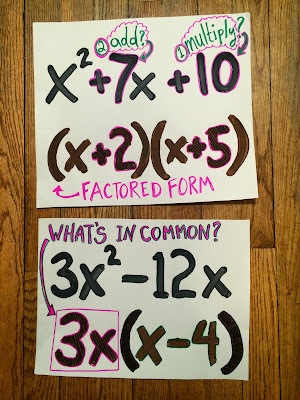 We teach a lot of vertex form in Algebra 2 so we reference these 3 anchor charts on our Algebra 2 word wall for nonlinear equations all year. These are updated printable versions of cut paper versions I finally retired this year. It was time. I love catching students glancing at our word walls for hints. To me, knowing how to access information is just as important as the information itself. Every year I add more and more to our classroom word walls. The more I add, the better things get. 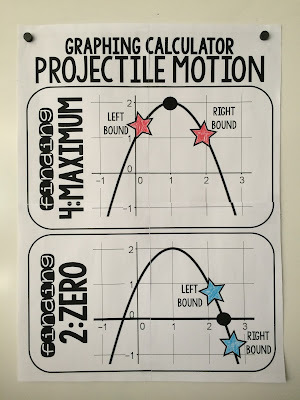 One of the free quadratics math posters that worked especially well during our combined graphing calculator/projectile motion unit - a unit that is VERY hard at first for my students - was this one. It shows good cursor placements for finding maximum points and zeros. My students get confused by "left bound" and "right bound" and this poster all but completely eliminates this confusion. 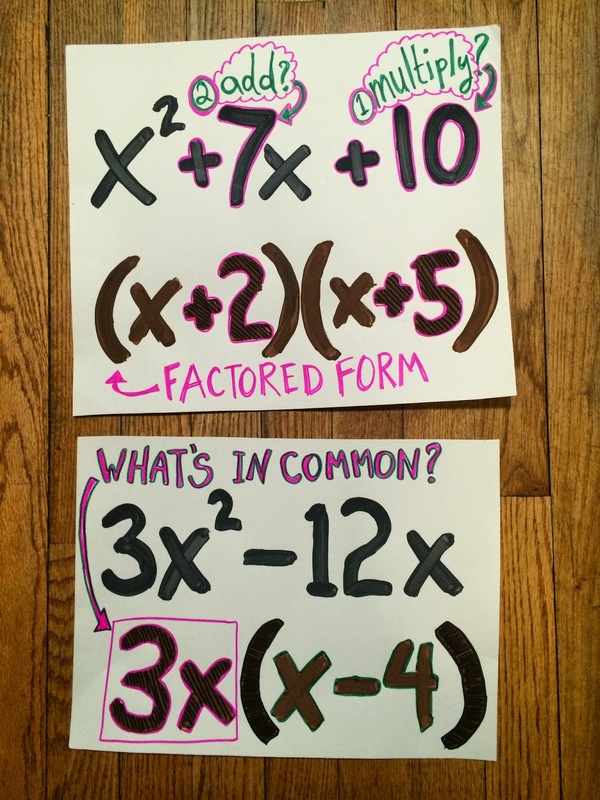 These factoring anchor charts hang in my room to remind my students how to factor trinomials and binomials. I always find my students have a harder time retaining how to factor binomials than trinomials! In an earlier post I wrote about our classroom Fridge, an area in our classroom where students are invited to display their hard work. I am always surprised that even my seniors would rather hang their work in our classroom than take it home. 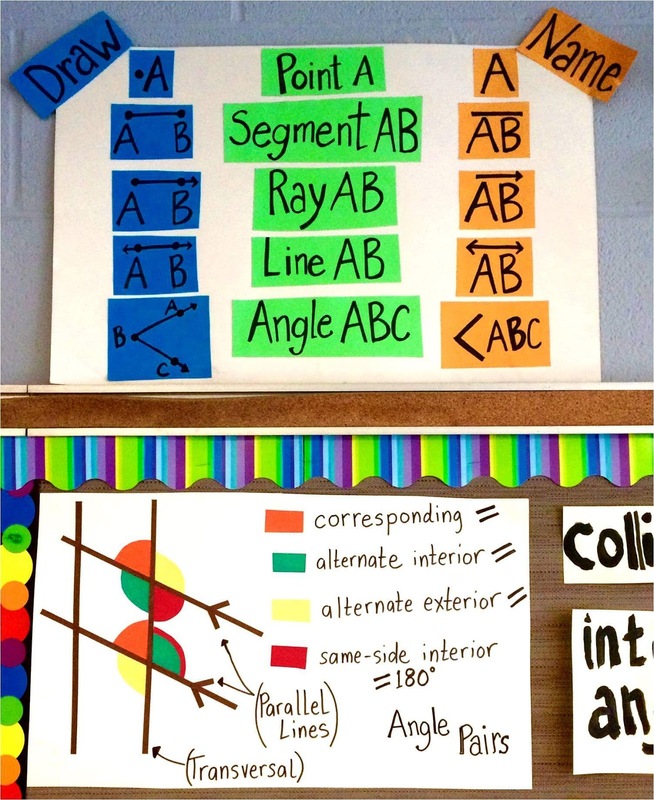 Math pennants are another fun way to display student work. 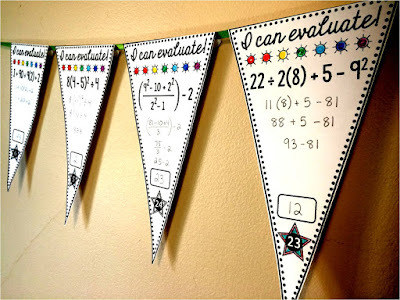 See more math pennants. With references on the walls I feel like a better teacher and my students feel less anxious and more confident in their ability to do hard math. The more I add to my classroom walls the more empowered my students feel and become. Do you keep these up all year or change them up throughout? I love this! We end up piling papers on top of others as the year goes on. A lot of the magnets are those really strong small ones that you get at hubby stores (at least that's where my husband got them before I stole them:). My classes are small so this probably works better than if I had 5 classes of 30 kids each. I can imagine things getting a little crazy then! I can't even imagine. I had a class larger than that once... it was impossible for me to find any success when there weren't even enough seats. To have 6 classes that large? I commend you! 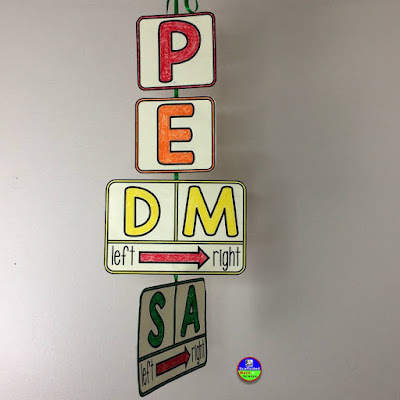 I wanted to let you know a mobile I added using your PEMDAS mobile. I made a second copy of it and hung it in reverse order, to reference the steps to isolate a variable. I tell the students "When we sssssSolve for x, use ssssssSADMEP". It was a great help this year! I love that for isolating variables, Mrs. Saeli! Thank you for sharing your idea! Do you start off the year blank? And as the year goes on add stuff as you cover content? I would love to do something like this this year. The kids appreciate an awesome looking classroom like this! Hi Elizabeth! I leave it all up all year. This way I figure it may add a little background knowledge (or at least some familiarity) before we get to the topic. How do you stick them on the wall? Do you print on regular paper or cardstock? Hi! I was wondering what you do during assessments? Do you cover the word walls? Hi Anmaree, To me, knowing how to access and use information is more important than memorization. I never cover them up. That being said, I would have to cover them if my kids had to take state exams. I'm lucky that I teach 11th and 12th grades and our state exams end in 10th grade. Wow, I love this! Making a creative and informative space is so fantastic at all levels. Thank you so much Betsy! It makes teaching a whole lot easier too:) Thanks so much for stopping by my blog! Do you have pictures of your biology word wall? I don't have a word wall for Biology but what a good idea! Thank you so much for this post as I am just starting to brainstorm ideas for a word wall in my high school math classroom. Did you get your word wall going this year? I’d love to hear an update! Thank you for sharing. I love all of these ideas! I am starting with a complete blank slate this year as I am moving back into the classroom (I have been the district special education coordinator for the past few years). I will be teaching 6 hours of resource room at the HS level and all different classes. I am so excited! Congratulations on your new job, Madelyn! I hope you have your best year yet! 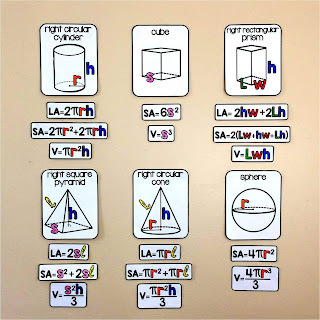 I just purchased your Geometry and Algebra Word wall sets. I am entering my 10th year of teaching and wanted something fresh. Very excited to see what kind of impact it will make on my students. Thank you! Thank you so much Stephanie! Adding word walls to my classroom helped my students and my teaching so much. I hope that you find the same to be true and that you have an amazing 10th year! Now that is an accomplishment! Where is your word wall in the classroom? Front, side or back of the room? Thank you for asking, Mary. I put word wall references on the sides and front of the room. The back of my room is all windows (otherwise I may have covered it, too:). I try to group similar topics together. I have one of your word wall bundles and LOVE them. Do you plan to add anything covering radical expressions, arithmetic/geometric sequence/series, permutations, combinations? Thank you for your question, Jen. 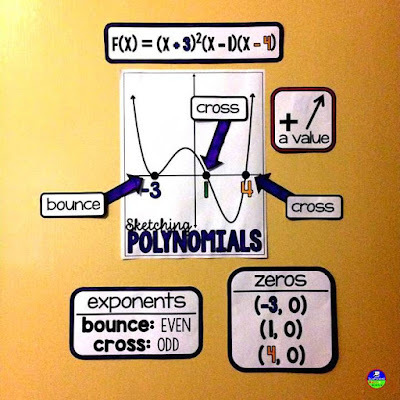 I have slowly been adding to all of my math word walls and I will add these to the list. Thank you for the suggestions. I hope you have a great school year.